The Isle of Man TT races could be streamed live for the first time as part of a new partnership announced by the Manx government. The Department of Enterprise (DoE) said it would work with US-based Pilgrim Media Group and global production and marketing company Digital Circus. A DoE spokesman said the partners would explore "long-term proposals for TV, film, e-gaming and live streaming". Pilgrim Media chief executive Craig Piligian said it was a "historic deal". Enterprise Minister Laurence Skelly said Pilgrim and Digital Circus could "significantly invest" in the event and "grow global reach" without the use of public funds. Permanent on-island full-time jobs will be created as a result of the partnership, he added. 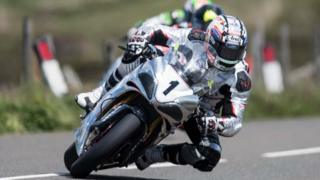 The annual TT races see motorcycle racers reach speeds of 200mph (322 km/h) on closed Manx roads. Mr Piligian, an Emmy-award winning producer, said: "We're extremely gratified to have forged such a historic deal that allows us to raise the profiles of the iconic TT, the Isle of Man, and of the riders whose fearlessness and individuality have built a competition like no other. "With the proliferation of entertainment and sports platforms, we believe this will be the global moment for the TT." The agreement also includes Digital Circus, whose founder Clark Bunting was a former president of the Discovery Channel. Mr Skelly said the deal offered "great potential to grow the reach and commercial value of the event". The Department of Enterprise will continue with all the existing rights contracts, including television highlights programmes.